Connect your Amazon seller account(s) to Brightpearl and manage all your inventory, prices, orders and shipments in one place. Brightpearl is connected directly to your Amazon seller account. If you have multiple Amazon accounts they are all connected separately and managed as separate sales channels. The app is only installed once. Your existing Brightpearl products and Amazon listings are connected SKU-to-SKU. New products can be created from your Amazon listing as you connect it. Changes to on hand inventory or the price in Brightpearl will automatically update the listing on Amazon. When a customer buys your product on Amazon there is a 30 minute window during which Amazon approve the payment method. Once the order is confirmed by Amazon it order will download into Brightpearl. If this is a returning Amazon customer the order will be placed against their existing record, matched by Amazon email address. The order will automatically add and allocate the Brightpearl inventory, reducing the on hand availability and subsequently updating all sales channels. Tax is calculated based on various tax rules designed into the app, and the tax controls within your own Brightpearl account. Amazon Prime orders will download and can be assigned a different status from standard delivery orders. The order will need to be fulfilled and shipped in Brightpearl and the items posted to the customer. An order can be split into one or more shipments. If dropshipping, a purchase order is sent to your supplier for them to ship the items. The Amazon order will need to be manually marked as shipped in Amazon. The shipped date in Brightpearl will be recorded in Amazon and used by Amazon to measure whether shipping rules have been adhered to. 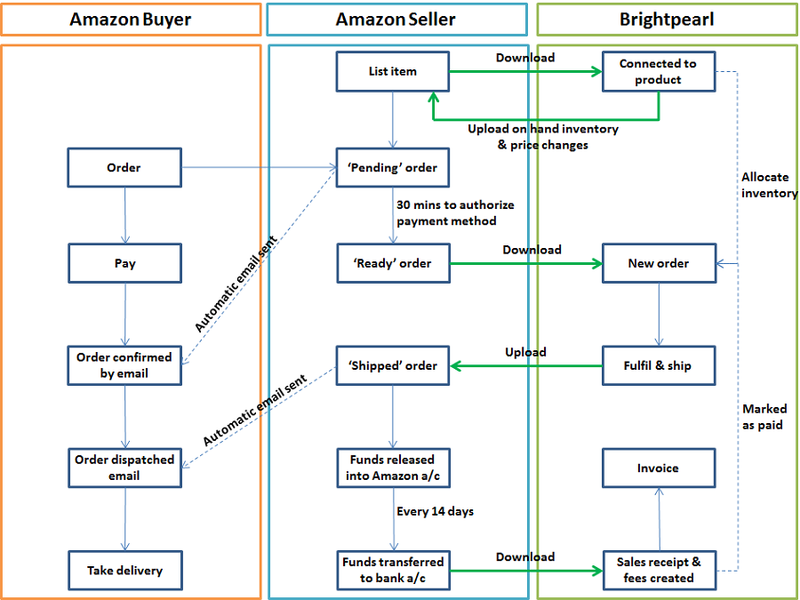 The Brightpearl to Amazon app supports FBA (fulfillment by Amazon). You need to add a "FBA warehouse" to your Brightpearl account that will be used to monitor and account for the inventory they are holding for you. You can now set an FBA warehouse by channel as opposed to the seller account, which means you can now track FBA inventory separately across different locations. When an FBA order is created in Brightpearl it will automatically get fulfilled and shipped so won't require any manual processing. SFP orders can be easily identified using the order status or a custom field, allowing you to filter those orders out and process them first. If you are using ShipStation, those orders will be prioritized in ShipStation and will only need to be marked as complete in Brightpearl which can even be done for you with Brightpearl Automation. Those fulfilled by Amazon will be treated in the same way as other FBA orders and get automatically fulfilled and shipped and won't require any manual processing. Only once the Amazon order is marked as “Shipped” is the customer payment is taken and added to your Amazon seller account balance. Amazon will make a regular transfer of your earning, minus the fees, as a lump sum into your bank account. A payment report is provided to give a break down of the funds and fees received. This report is automatically downloaded into Brightpearl to mark the orders as paid and create the sales receipt and fees accounting. If the order is cancelled during the initial 30 minute window no order will download so no further work needs to be done. Later cancellations are handled differently depending on what stage they have reached in the sales cycle. Generally the order will need to be cancelled in both Brightpearl and Amazon, the process required depending on what stage the order has reached in the sales cycle. Each separate Amazon marketplace and each separate seller ID which you use will create separate sales channels in Brightpearl, allowing you to report on sales per marketplace and per seller ID. Prices, inventory and orders can be synchronized per marketplace.